Three years ago on this exact day, I met with an emotion never before introduced to me. I still don’t have a name for it. It was a concrete intangibility of anguish to which, until that moment, I had always been a stranger. The emotional repercussions of man’s tenuity against the inevitability of his mortality are never uncomplicated. I still haven’t been able to quite repair the pieces of acumen that were broken that day. Here is the entry I wrote for the contest I mentioned back in September. It didn’t win (ugh. ), so now I can publish it wherever and however I wanna. I publish it here, today, in my private public space, in honor of my dearest, darling-est, uncle. He has impacted me almost more in his absence than in his existence. Here’s to always missing you, Brad. You are loved. I once read this quote from Anais Nin: “Love means abandonment… Either be abandoned or abandon first.” Impulsively, I disagreed; something that brings such fullness to life certainly cannot be characterized by loss. Then, as I considered all the synonyms of that four-letter-word that I have encountered in my innumerable and varying affairs of the heart, I realized love can mean many different things: infatuation, completeness, joy, surrender… Ah, “surrender”. Maybe that is what Ms. Nin was referring to. For when we truly love, we surrender. We surrender safety to vulnerability and the possibility of sorrow and pain. We do this because something innate within us believes that it will be worth the risk. Why? Because the goodness that permeates our beings from allowing ourselves to truly and honestly love, that champions the fear that comes with realizing that with one heartbeat, we could lose it; we could be abandoned. I count as one of my most cherished possessions a weathered Post-It note. On it, this message: “Brit, Use this money to fix your car. You are loved. 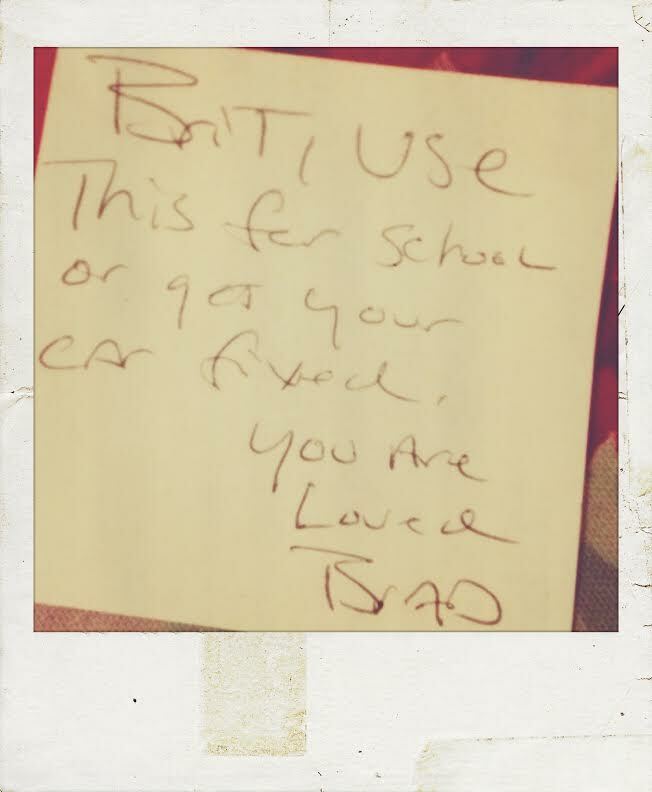 -Uncle Brad.” What that small piece of paper lacks in tangible matter, it makes up for in consequence. He was our bachelor uncle; charismatic and smart and handsome, and the kind of funny you don’t quite understand when you’re little, but as you grow up and understand it, becomes the kind of funny you wish you were. My fondest childhood memories of him stem from day trips to the beach and helping me find sand-dollars, “sheet rides”, checking my brothers and me out of school for a trip to Knott’s Berry Farm, Popsicles for breakfast, money for the neighborhood ice-cream truck, and protection from the other neighborhood kids who had bigger squirt guns than I did. Never, no never, has anyone so fondly held the title of “uncle” as did my Uncle Brad. My adoration for him accompanied me into adulthood: In my early college years, he provided comical substance and emotional sustenance with his letters, birthday cards, and phone calls. Nothing stands as a more poignant reminder though of the kind of heart he had than does that aforementioned Post-It note, which initially clung to a $500.00 check. He absolutely did not have that kind of money to give away. But he gave it anyway. Because he had a niece with a broken car and thus a broken spirit. Indeed, if Uncle Brad loved you, surely you knew it. When I think about the innocence of my childhood, I miss it. I mean the innocence that comes with naivety, with not knowing: not knowing about grief, not knowing about the demons to which all humans are susceptible. I miss the innocence that comes with not knowing that your family won’t always be as it is then, that they won’t always be how they are, and that they’ll never be anywhere but with you. 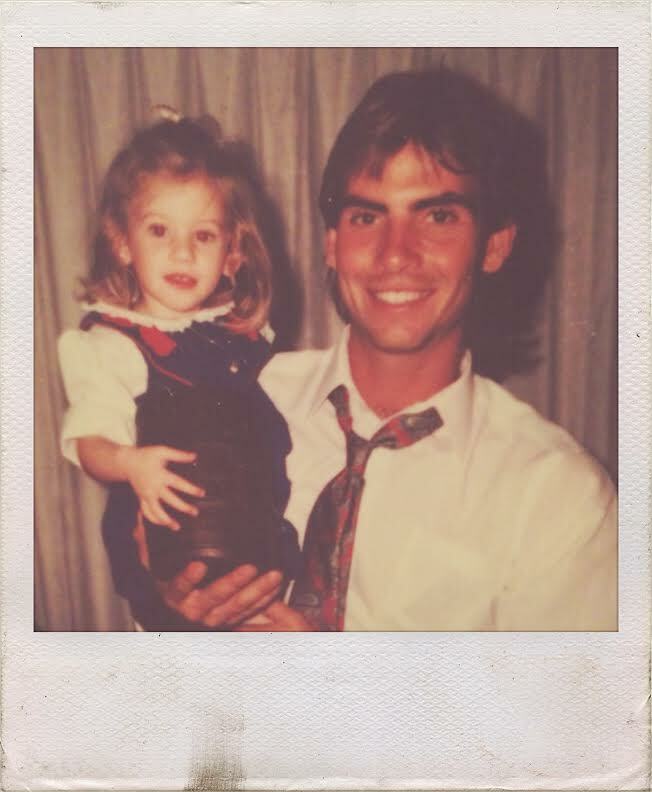 When I was his little niece, being flung in his arms in a wrapped up sheet, belly laughing and full of glee, I had no idea that lurking within and taunting my beloved uncle was that shadowy adversary, Addiction. I remember when I found out. That was the day my childhood innocence was shattered because my family became susceptible, and I surrendered. I was sixteen or so and we had just gotten to a beach house for a family vacation- a total Smith Fest. I ran downstairs to go say “Hi” to my favorite of the bunch. I found him- fumbling around and babbling incoherently. “He’s trying to be funny“, I thought. I threw my arms around him and greeted him anxiously. But he peeled my arms away and pushed me aside. “Very funny, Uncle Brad…“. I laughed and smacked him on the back. He turned around, with a glare I’ve never seen on his face before: “Leave. Me. Alone.” Paralyzed by bewilderment, I probably stood there for a whole minute before I could even move. When my mini-coma elapsed, I made my way up the stairs, slowly at first. By the top I was running into my mom’s arms, flooded in confusion and tears. She and I left the beach house that day and she explained everything on the drive home.We returned the next day, after my dad and other uncles had given him an ultimatum: your fix, or your family. He chose us- of course he did. For the week anyway. I left that vacation with a changed heart. I loved him more than ever, but he wasn’t the uncle from my childhood anymore. He was feeble, and I had never viewed him that way before.When I was finally old enough to grasp his relationship with his drugs, the negative space left by the erosion of my childhood innocence was filled by grown-up compassion. Of course, he made me angry at times. Livid, even, as I witnessed how much his choices hurt our family. After countless stints in rehab, I couldn’t understand why he wouldn’t just recognize the damage he was doing to all of us who loved him so adoringly. But Addiction is not a fiend easily thwarted, is it? I was ever-hopeful, though. I hoped against hope for any semblance of rescue from that relentless and malignant foe which held him captive. Any interactions I had with him were seemingly positive- but he was mere traces of himself. There was a sadness about him that hadn’t existed before. Or, maybe it had. But that exquisite protector, Childhood, had blinded my innocent eyes to it. Christmas of 2008 was the last time I saw him. That was one of those times I was angry. If only I could do it again, I would have surrendered that anger and just let myself feel the love that I’d always had for him. If only. I was sitting on my grandma’s couch. He walked past it from behind, and stopped. I glanced behind me, uttered an artful “Merry Christmas”, and turned back around, not granting him anymore of my time. ‘s Christmas spirit at it’s finest. Two months later I was back at school, relishing in the social delights of independence, when my phone rang. It was my dad. He asked me if I could talk, and there was nothing in his voice to give me pause. I stood up and slowly made my way into the hallway towards my room but only made it as far as the doorknob: my knees caved, my grip around that doorknob loosened, and my body wilted to the floor. I sat there barefoot on the unsympathetic and arctic tile, and fell prey to my indomitable tears. He was gone- another one of those four-letter-words. My darling and doting and drug-ridden uncle was gone. His funeral was the most foreign experience of my life. “Everyone’s here but Brad“, “He should be here with all these people who love him“, “He’s late- typical“, “Oh that’s right, he IS here- he’s in that…box”, etc. It was a convolution of thoughts I will never be able to apprehend. I was able to sneak my own private goodbye at the burial service. I remember none of the words I spoke, only feeling, literally, like my heart was different. I was changed. All that love and hoping in his behalf- it had made me more “me”. So yes, I would tell Ms. Nin (if she were still here and I had the good fortune of conversing with her): “You were somewhat right.” Because though I’ve loved much and loved often, it was through Love’s abandonment that I learned that love is most pure when it is unprejudiced. I know this because I loved him more in his debility than I did in his seeming sobriety. In all my pretenses of love in those aforementioned love affairs, unfeigned was never a word I could claim. Uncle Brad taught me that it is only through love unfeigned that we are able to understand ourselves better- to become more of who we are meant to be. Through being loved by and in loving my frail uncle, at the ripe old age of sixteen, I learned that the real meaning of love is that it will make you hope for better things. Despite all the pain that his addiction bred, I never stopped hoping that he would heal. Now that he is gone, I have learned that though all the love in the world cannot change the “bestowed”, it can change the “bestower”. I now choose to love openly and honestly; however susceptible that makes me. I surrender to the possibility of abandonment because I know that in letting my heart beat as it will, as much as it will, for whomever and why ever it chooses, the hope for something better that will chime with each heartbeat will echo over the fear that I very well could lose the “bestowed” forever. Lovely. Really. He was (is) lucky to be loved by someone like you.